The Emperor Card usually represents success, authority and creativity. 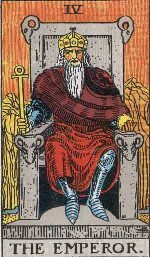 The holder of the card is usually ambitious, or depending on what the other cards are in the divinatory spread, the ambitions of others. Emperor is the other pole or the other half of our personality, the first and the better half being the Empress. Emperor represents the man in his prime of youth who is dynamic, successful, secure, self-confident and well settled in his life. Whereas the Empress is associated with the Moon, the Emperor is aligned with the Sun. The Emperor is an energetic, quick and aggressive person. He is a born leader and loves to rule over others. But he has to be considerate, sensitive, caring and compassionate if he wishes to win the hearts of those he intends to lead. Though he may take his own decisions, he must cultivate the virtue of listening to others with patience. He symbolizes the fatherhood—a fertile man, defender of the vulnerable and provider for the needy.